Deal For Shore Power at Brooklyn Cruise Terminal ..... is DONE! The great news came today, via a press release from Mayor Bloomberg (here), and articles in the New York Times and South Brooklyn Post, that a deal that will allow cruise ships visiting the Brooklyn Cruise Terminal in Red Hook to plug in to shore power is done. The deal between the NYC Economic Development Corporation and the New York Power Authority creates a rate of supply for the electricity that the ships will use for their on-board power while in port, instead of idling their extra-dirty diesel engines, as they currently do. This electricity rate will be set for 5 years, and, presumably, by that time, the slow moving Public Service Commission will have created a permanent power rate for the ships and this pollution mitigating practice can continue. The deal for the rate of electricity supply was the missing piece in the multi-part plan to make the use of shore power in Brooklyn a reality. The Port Authority, aided by an EPA Diesel Emission Reduction grant, had committed funds for the building of the appropriate infrastructure, the cruise operators, Carnival, had committed to retrofitting their ships to accept shore power, and basically everyone else was "on board". The sticking point was the rate of electricity supply to the ships, and a case in the Public Service Commission requesting the creation of a permanent "shore power tariff" had been stuck in some sort of limbo for over two years. So, even though the PSC case is still not resolved, this 5 year deal allows for the shore power plan to finally ... and thankfully ... move forward. The announcement today was the result of the work of many, including the previously mentioned NYCEDC, the Port Authority, Carnival, the EPA, the NY Power Authority, the Mayor and City of New York and many of our representatives in government. But it should be remembered that it was the community that forced this issue into the public realm and onto the politicians' agenda. It was our residents who pushed for this improvement to their quality of life. We were acting in response to our concern about the negative affects of these dangerous yet avoidable substances, contained in the smokestack emissions of the ships, on the health of our residents, our neighbors - particularly to our most vulnerable - children, the elderly, minorities and low-income populations, people with lung disease and asthma. There was a lot of good will shown in today's announcement, and a lot of people were speaking and writing passionately about the benefits this plan will bring to our neighborhood and beyond, and much congratulation was given to these different agencies for the the great work they have done in making this happen. 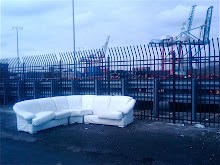 But 6 years ago, when the Brooklyn Cruise Terminal opened, I'm sorry to say, there was not a single mention or word of acknowledgement from anyone - politicians, government agencies, Borough Presidents, anyone - about the negative health effects that the newly visiting ships would be bringing to our portside neighborhoods. There was not a single line in the New York Times nor the Brooklyn Papers about the dangers of port pollution - from ships or other sources. Nothing about the tons of SOx, NOx and Particulate Matter that would soon be spewing into our neighborhoods' air and into our residents' lungs. When I wrote my first letter to the Mayor in 2005, asking whether the ships that would soon be calling my young family's neighborhood home would be "cold ironing" - i.e. 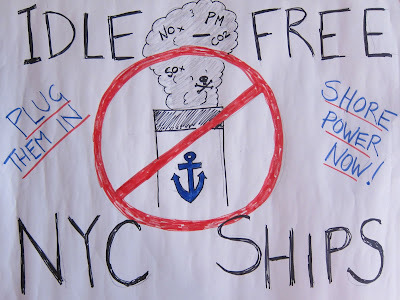 using shore power instead of idling their dirty diesel engines, as I had read was being done in many ports on the West Coast and elsewhere in the world - the response from the City was, "No" - this pollution mitigating and life saving technology was not being considered for Red Hook. After a number years of just talking about "cold ironing", talking to my neighbors, writing emails to friends and politicians, going to Community Board and other meetings and talking about this stuff, etc. there was still little discussion about cleaning up the pollution from the ships - at least from anyone who had any power to do something about it. Finally, in 2009, after the expansion of the operations of the Container Terminal and after the concern in our neighborhood about port related pollution was starting to register, the Port Authority came to our neighborhood and said they were committing to establishing shore power infrastructure at the Cruise Terminal. It was good news - but the representative from the Port Authority told me he had only recently, "in the last year or so", heard about "cold ironing". Really? 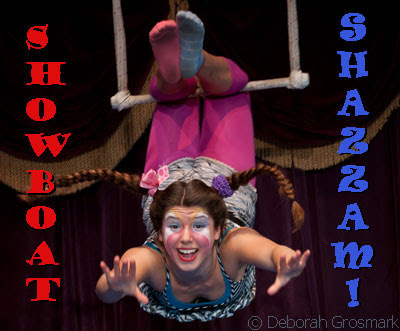 The Port Authority had heard about "shore power" 4 years after I had first read about it, 9 years after the first US cruise ship cold ironing port in Juneau, Alaska, and decades after the Navy had been using the practice? That was worrying. It was around this time that I started writing this blog in an effort to share some of the information I was discovering about this issue. It was also an attempt to push the case for shore power at the Brooklyn Cruise Terminal and elsewhere on our waterfront. But this was just one little blog, and to really get the shore power plan to happen there needed to be political will, and pressure from the major press. There was very little forthcoming. The Brooklyn Papers wrote a piece here and there, the the NY Times did a piece, but the coverage was pretty thin. It was frustrating. 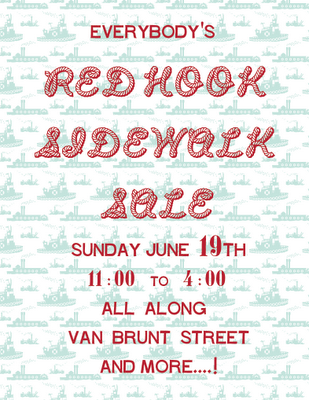 However, there were more and more people and organizations in the community becoming aware of this matter - the Red Hook Civic Association, Red Hook Economic Development, Red Hook Initiative, COWNA (including the indefatigueable Diana Schneider - an early advocate for this cause. Thanks Diana!) , Community Board 6, and more - and they were making their concerns known, and that's when things started to happen. Armed with facts and statements made to the Public Service Commission from the EPA (see the sidebar of this blog) and elsewhere regarding the health impacts these emissions were having - cancer, asthma, heart and lung disease and more - the community started to drag some politicians into fighting this fight on our behalf. The newly elected Councilmember Brad Lander was a standout, taking this issue on as one of his highest priorities. The same was the case for Congresswoman Nydia Velazquez, and soon State Senators Daniel Squadron and Velmanette Montgomery, Assemblywoman Joan Millman as well as Councilmembers Sara Gonzalez and Steven Levin were on board. Despite further testimony from the Port Authority supporting the creation of a shore power rate, citing $9 million per year in health care savings to Brooklyn residents resulting from a switch to shore power, the case at the PSC was still stuck in the mud, but these representatives started letting them and the City know that that it wasn't good enough. Despite the real seriousness of "port pollution" issues, and the situation in Red Hook, coverage in the New York media was still non-existent (negligent, in my opinion), with not a single story written in over a year. However, in November, 2010, the newly launched South Brooklyn Post took up the matter and did an excellent story (here) on the stalled plan to bring shore power to Brooklyn and about this blog's coverage of the issue. Earlier this year, on a cold morning in January, many of these previously mentioned representatives staged a protest rally at the cruise terminal hoping to force the negotiations forward and to get a resolution to the impasse that was stalling this plan. Again, the South Brooklyn Post covered the story, and thankfully - due to the high profile political presence - a lot of other media outlets covered the rally as well (my post here). The City's Committee on Waterfronts scheduled a hearing on shore power, proposing a resolution supporting the creation of a shore power tariff and urging the PSC to create it, urgently. The hearing was postponed (twice) but the message was clear. A long term plan is needed, and this shore power plan needs to go forward - now. It was clear for a while that the NYCEDC, who had built the terminal, and the NY Power Authority were working towards a deal to make the shore power plan happen - regardless of the outcome or glacial pace of the PSC case. 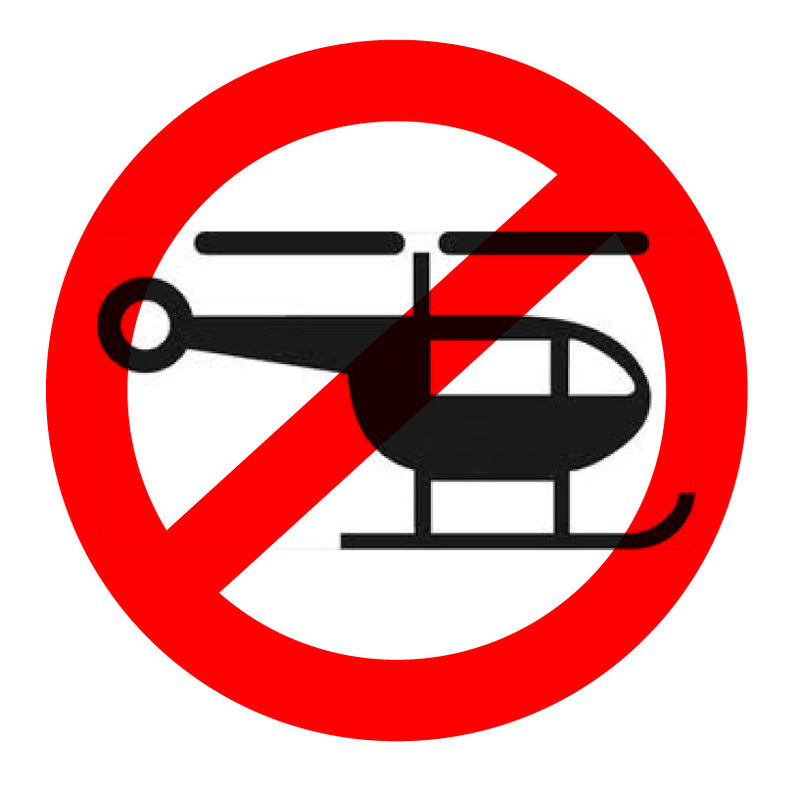 The pressure from the community, the advocacy of the politicians and, finally, the scrutiny of the press was requiring a solution, even if it was short term. 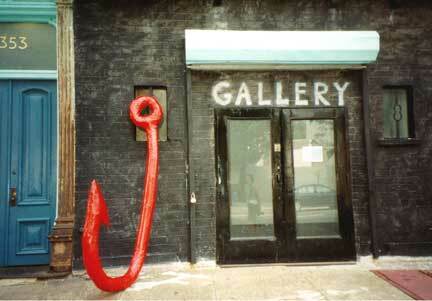 It seems that Mayor Bloomberg, who had so far kept a low profile on this issue, was also keen to get this done. Then came the news today. It was a good day. The Mayor, the representatives, agencies and other parties involved should be congratulated on their efforts in getting this done. Everyone should be feeling good about this. But, something tells me that if we hadn't "kicked up a fuss", none of this would have happened. "Shore Power Resolution" Hearing Delayed ... Again. Unfortunately, there was miscommunication about the Committee on Waterfronts' Shore Power Resolution hearing that was was scheduled to have happened this last Tuesday (see my previous post). After the postponement of the hearing last month, I, and others who were invited to testify, were given notice that the hearing had been "tentatively" rescheduled for March 8th. However, it wasn't clear that there would be further confirmation of the hearing (I figured that if we didn't hear otherwise that it was happening, not that it wasn't). So I, and a couple of others, turned up at the hearing to find that a hearing on dredging, not shore power, was taking place. It was a bit of a waste of a day, having missed out on work as a result, but I do understand that some of the responsibility to check the confirmation of the hearing lies with me. However, even the organization that had invited me to testify, the Red Hook Initiative, despite being in communication with those organizing the hearing, weren't aware that the hearing wasn't going to happen. They, too, were left out of the loop on this one. From speaking to a couple of people involved in this matter, it seems like the reason for this second postponement was due to a yet to be announced agreement that would, in the short term, subsidize the rate of electricity being supplied to the ships, thereby reducing the economic "burden" on the ship operators, Carnival, of plugging in and using electricity, rather than idling their engines and burning extra-dirty diesel (creating carcinogenic and otherwise dangerous emissions) while the ships are in port. This agreement was hinted at by a spokesman of Mayor Bloomberg in this recent South Brooklyn Post article, here, where the representative, Andrew Brent, is quoted as saying that the pending deal "would benefit all of the parties involved, and we're all working to finalize one." This is obviously good news, and the deal, if secured, should ensure that there is a workable, quickly implementable short term solution to the frustrating stalemate that has been delaying the plan to get the cruise ships to plug in to shore power at the Brooklyn Cruise Terminal in Red Hook. I don't see, however, how the news of this interim deal (even if it's in place for a number of years), takes away the urgency of getting a real, long term solution in place. That's exactly what this "Shore Power Resolution" was hoping to spur. The resolution was urging the Public Service Commission, which has been dragging its feet on this case for two years, to finally create a "shore power tariff" - a special rate of supply of electricity - that would be supplied by Con Ed and would allow the ships to plug in at the Brooklyn terminal. This would be a permanent tariff, so it could be the piece that puts in place the long term solution that everyone has been waiting for. This "shore power tariff", if created, could also set the precedent for other uses of shore power and the practice of "cold ironing" (ships turning off their idling engines) throughout the ports of New York and New Jersey. 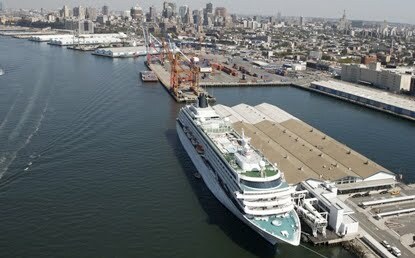 The Port Authority has said, in addition to its use at the Brooklyn location, that it would also like to bring "shore power" to the cruise ships visiting the Manhattan Cruise Terminals, and has outlined plans to create a new "cold ironing" berth at the Howland Hook Container Terminal in Staten Island. Presumably, these plans are all contingent on the creation of a "shore power tariff". Adding impetus to this matter, there was also the news, this week, that the Ports of New York and New Jersey increased their business by 16% last year. A spokesman for the International Longshoremen's Association in Newark is quoted in this New York Times article, here, as saying, "We're doing super great". In an economy that's still struggling to find its feet, this is good news, but with the booming business, there comes more ship movements, more idling while in port and - unfortunately - more pollution and more people bearing the burden of the resultant negative health impacts - in cancer, asthma, heart disease and more. That's why it's so important that the Port Authority keeps driving towards 'greening' the operations of their ports. The use of "shore power" for ships should be a big part of any plan to do so, and the creation of this "shore power tariff" would surely create the incentive for the building the infrastructure to allow all types of ships to plug in - container, cruise and others - as has been the case on the West Coast and elsewhere. The short-term solution, referred to by the Mayor's representative, won't do a lot (as far as I can see) to address this "bigger picture" issue - i.e. pushing the Public Service Commission to create a shore power tariff, so that the cruise ships can plug in at the Brooklyn Cruise Terminal, while also setting a precedent and encouraging the expansion of this life-saving and green-house gas reducing practice throughout the city's ports. The "Shore Power Resolution" is pushing for this big picture, long term solution. (Read it at the end of this post). So, I say, let's not delay this hearing any longer. The Public Service Commission has already shown that it is capable of moving at a glacial pace. I don't see why the City's Committee on Waterfronts should be mimicking them. City "Shore Power Resolution" Hearing - Tuesday, March 8th, 1pm - Open to the Public .... More Shore Power News. 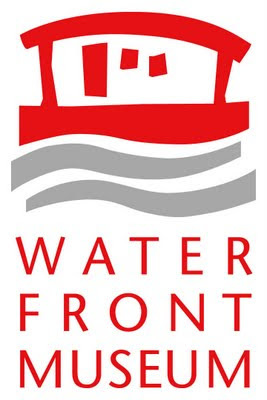 The City's Committee on Waterfronts has rescheduled its hearing on the proposed "Shore Power Resolution" for this Tuesday, March 8th at 1pm, 250 Broadway, 16th Floor. The hearing is open to the Public. See one of my previous posts (here) for the details of the resolution which has been proposed by many of our City's representatives (I've copied it in its entirety at the end of the post). 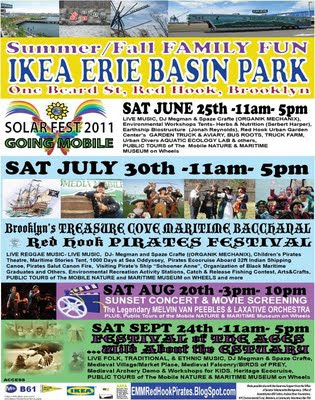 Basically, this resolution urges the Public Service Commission (PSC) to set a "shore power tariff" - a rate of electricity supply - that would then be offered by Con Edison to allow cruise ships to plug into "shore power" while in port at the Brooklyn Cruise Terminal in Red Hook, instead of idling their extra-dirty diesel engines, as they currently do. The adoption of the recommendations of this resolution would bring great benefits to the neighborhoods surrounding the port - Red Hook, Carroll Gardens, Cobble Hill and beyond - both in improvements in air quality and in the resultant health benefits. The EPA states that smokestack emissions from ships are particularly harmful to our most vulnerable - children, the elderly, minority communities and people with lung disease - and the Port Authority has made statements in testimony to the PSC that estimates the yearly savings in health costs to Brooklyn residents resulting from the switch to shore power at the Cruise Terminal "approaches $9 Million". The setting of the shore power tariff seems the be the preferred long term solution to finally getting the cruise ships to plug in at the Brooklyn Terminal. There have been arguments - also made in this blog - that the cruise ship operators are getting off pretty easy in this deal. After all, they're doing very well, paying little tax, and their business is breaking records. Also, in the long term they'll be having to deal with a higher price for cleaner diesel when the Emissions Control Area is implemented around the coasts of the US and Canada. However, it seems like to get this done, absent some form of legislation that would require the use of shore power (as is the case in some West Coast ports), this special rate of electricity needs to be created to actually get the cruise ships to "plug in". There is some logic to this path being taken. If a shore power rate is created for Brooklyn, it should set the precedent for the use of this technology anywhere in the Ports of New York and New Jersey. The Port Authority has stated that it has plans to create a "cold ironing" berth at the Howland Hook Container Terminal in Staten Island. Surely they'll need a "shore power tariff" in place to make that plan feasible. The EPA stated in testimony to the PSC that "implementation of an appropriate Shore Power Tariff in New York City would provide an impetus for ship owners to invest in ship-side Shore Power equipment and for widespread use of this technology in other ports on the East Coast." SHORT TERM SOLUTION - via Mayor Bloomberg? Hopefully this resolution will get the result it seeks for the long term solution to this problem. However, the PSC moves very slowly, and in the short term, we still need to get the ships to plug in so these dangerous emissions can be taken out of our neighborhoods' air. On that front, there is this news - under-reported as it is - from the South Brooklyn Post, reporting that Mayor Bloomberg says there is a deal in the works for a short-term solution for the Brooklyn cruise ship pollution problem. Andrew Brent, a spokesman for Mayor Mike Bloomberg, contacted South Brooklyn Post to say that a deal is in the works to solve the major air pollution problem on the coast of Red Hook. 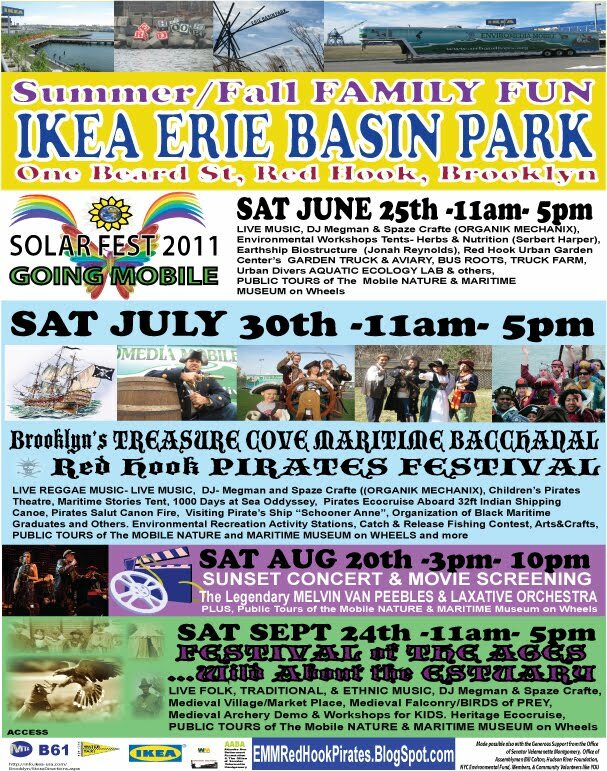 Brent was responding to a series of articles in South Brooklyn Post revealing the fact that Carnival Cruise Lines, which netted $6 billion in profits over the last three years, is at a stalemate with city and state officials over a $1 to $2 million a year electricity bill that would clean Brooklyn’s air and the air quality over the New York harbor. “A deal would benefit all of the parties involved, and we’re all working to finalize one,” Brent wrote in an email. 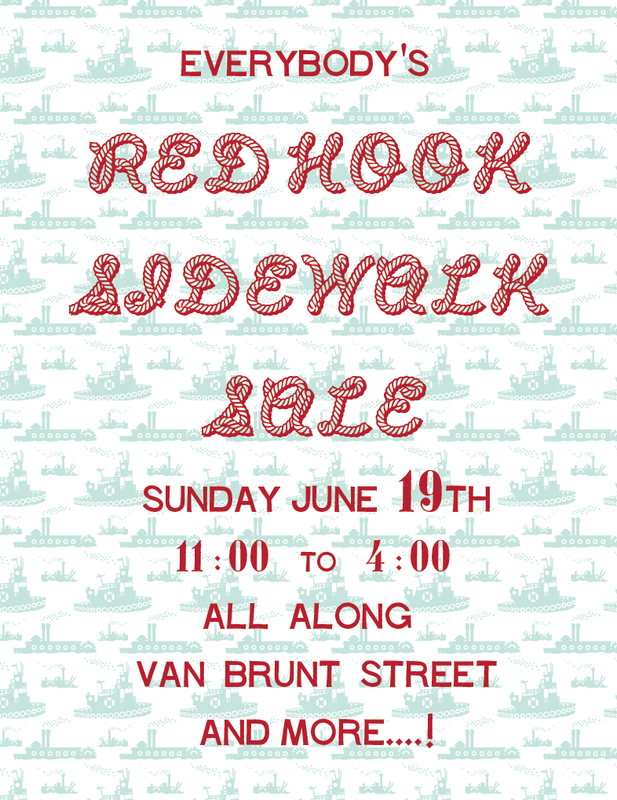 The South Brooklyn Post also reports that Port Authority studies reveal that "ships are the No. 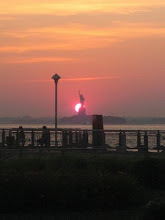 1 cause of air pollution in the New York/New Jersey harbor". "The European Sea Ports Organisation (ESPO) and European Community Ship-owners Association (ECSA) have come out in support of a proposed European tax exemption for shoreside power electricity." "The study also said using shoreside electricity should be made mandatory because "unless ships are obliged to use it, they have few incentives to do so." The study focuses on the Ports of Los Angeles, Long Beach, Vancouver, Rotterdam, and Busan." 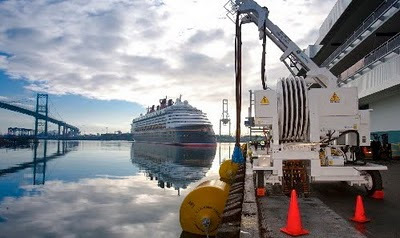 Meanwhile, the Port of Los Angeles has upgraded one of its shore power facilities to accommodate three different cruise lines, with the ability to "plug in" two ships at a time. Story here and here. It's frustrating to see these shore power incentives and initiatives, whether "sticks" or "carrots", being used elsewhere - on the West Coast and around the world - while we on the East Coast, and in Brooklyn in particular, are still waiting. Hopefully, this new City resolution will be the piece that finally gets all involved to the get this shore power deal done so that we can begin - yes, just begin - to take these harmful, yet totally avoidable, pollutants out of our city's air, and our residents' lungs.